Journal of Neurology and Clinical Neuroscience is a peer-reviewed, scholarly open access journal that offers a platform to the scholars, amateurs, clinical practitioners and students that are keen in contributing their findings in this field. This journal welcomes the neurologist to contribute the current diagnosis and treatment of neurological disorders. 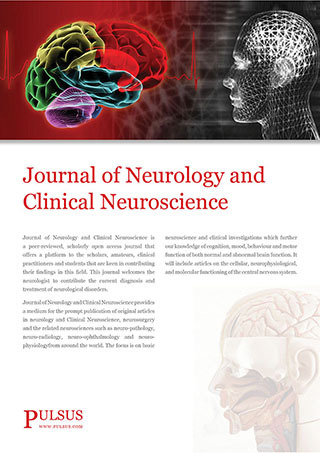 Journal of Neurology and Clinical Neuroscience provides a medium for the prompt publication of original articles in neurology and Clinical Neuroscience, neurosurgery and the related neurosciences such as neuro-pathology, neuro-radiology, neuro-ophthalmology and neuro-physiologyfrom around the world. The focus is on basic neuroscience and clinical investigations which further our knowledge of cognition, mood, behaviour and motor function of both normal and abnormal brain function. It will include articles on the cellular, neurophysiological, and molecular functioning of the central nervous system. Original research in the form of case series, reports are considered. Case series dealing with clinically relevant laboratory studies, review articles and debates on various aspects of neuroscience and neurology, commentaries on new developments in clinical neuroscience are considered. Furthermore, letters to the Editors on clinical cases and the exchange of ideas which highlight significant new findings are published. ﻿Author ma﻿y submit the manuscripts through the journal's online submission and tracking system which is located at www.editorialmanager.com/pulsus or as an e-mail attachment to [email protected]. Copyright © 2019 Pulsus Group, All Rights Reserved.